Bill Maher’s Trump Derangement Syndrome is worsening. The late-nite host has made a string of increasingly insane comments against the president and his administration. Now Maher just had one guest on his show to fuel his hatred of Trump. Bill Maher is an unabashed leftist. On the issue of free speech, he’s an old school civil libertarian, but he’s becoming increasingly radical on other issues. And the catalyst for that is Donald Trump. Maher honestly believes Trump is going to anoint himself president for life. He believes this so strongly, Maher said he was hoping for a recession in order to get Trump out of office. Maher said people had a choice: suffer a recession or lose democracy. A recession doesn’t just hurt fat cats; it stings everyone. The largest fund in the market is the California teachers’ pension, so real people’s retirements are hit when the market tanks. But Maher only cares about his vendetta against Trump. The panels on his show used to consist of a balanced perspective with many conservatives appearing, but lately, the show has had a more uniformly left message. The most recent example of this is an appearance by NFL runningback Marshawn Lynch. Lynch was one of the anti-American anthem protesters that joined free agent quarterback Colin Kaepernick. And Lynch was one of the worst offenders. 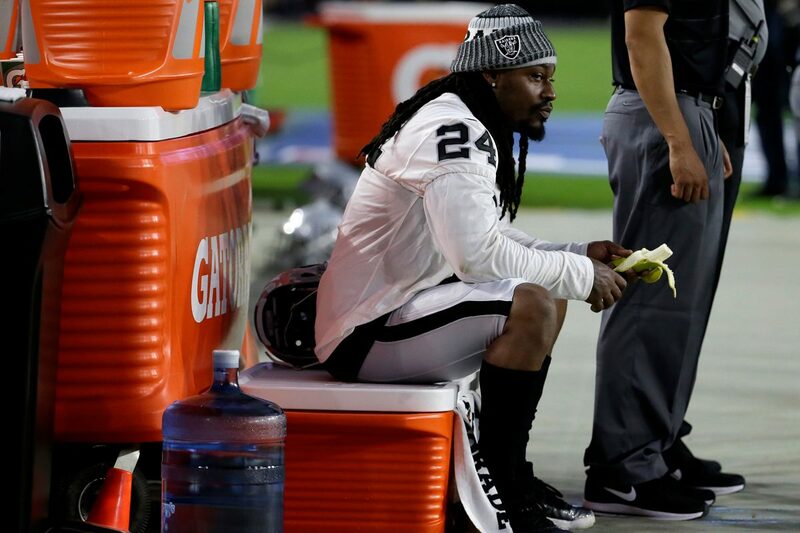 During a game in Mexico City, Lynch sat for the Star-Spangled Banner, then stood for the Mexican national anthem. Trump called out this disgraceful act on Twitter. Lynch responded to the criticism by wearing a t-shirt that said “Everybody Vs. Trump” before a football game. When Lynch appeared on Maher’s show, the host was all too eager to bring up Trump even though these incidents happened over a year ago. The audience predictably howled as if they were a laugh track. Lynch’s charitable spirit is commendable, but disrespecting the country that afforded him the opportunity to have the riches to help people in his neighborhood is tragic. Lynch’s attitude is indicative of a larger problem in society. The left has taught Americans to hate their own country. A recent poll showed that only 14% of millennials believe America is the greatest country in the world. The left celebrates anyone and anything that demeans America. Hollywood elites like Maher and sports stars like Lynch are the perfect vessels to deliver this message of hate. They no longer believe in Americanism. If America falls, the things Maher and Lynch value—like free speech—will be long gone.